The next level in highly bioavailable Coenzyme Q-10 (ubiquinone). Co-Q-Sol 100 CF uses d-Limonene, an oil extract of citrus fruits to decrease the particle size or crystals found naturally in Coenzyme Q-10. This decreased particle size enhances absorption and product effectiveness. CoQ10. CoQ 10 serves two main functions in the body. As an antioxidant, CoQ 10 protects proteins, LDL ("bad") cholesterol, and mitochondrial DNA from oxidative damage. As a participant in the production of cellular energy, CoQ 10 helps ensure the body's biggest energy consumers — the heart and the brain — are well-fed. d-Limonene. Extracted from the oil of citrus fruits, food-grade d-Limonene acts as a non-polar organic solvent that solubilizes CoQ 10, without causing significant chemical interactions or degradation. Tocopherols. A form of vitamin E, tocopherols enhance the biological function of CoQ 10, which in turn helps maintain the antioxidant state of vitamin E.
Coenzyme Q10 (also called ubiquinone) is present in almost all cells, where it is necessary for mitochondrial energy production. The body's highest concentrations of Coenzyme Q10 (CoQ10) are found in the heart, where constant chemical energy availability is imperative. In addition to its benefits for cardiac function through energy production, CoQ10 also functions as a powerful fat soluble antioxidant, providing protection against free radical attack for vascular structures, as well as for other tissues. Contains no:sugar, salt, starch, yeast, wheat, gluten, corn, milk, egg, shellfish, preservatives or titanium dioxide. 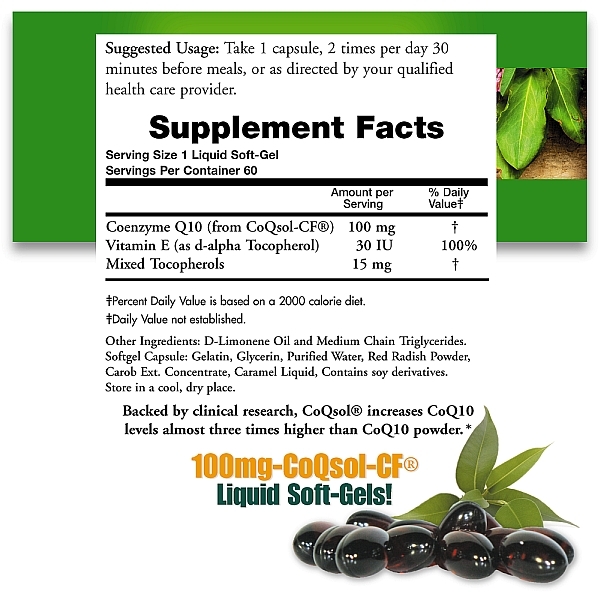 CoQsol-CF® contains CoQ10 that is Pharmaceutical Grade. CoQ10 products contain only the natural, all-trans form of CoQ10 produced by fermentation. CoQsol-CF® is a registered trademark of Soft Gel Technologies, Inc.